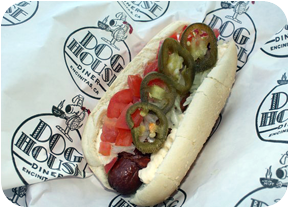 Custom printed Hot paper is the most unique food service paper, and greaseproof paper on the market today. This one of a kind coated food wrap is the perfect eco-friendly substitute to cushion foil. Hot Paper is both microwave and oven safe up to 375˚. This means you can reheat your food without having to unwrap it first! What other food service paper will let you do that? This Hot Paper food sheet is truly a one of a kind product that will impress even the biggest food critics. This unique food service sheet is bound to HEAT UP your food service presentation! Custom printed Hot Paper has a 3 case = 6,000 sheets (2,000 sheets per case), OR 5 rolls = 5,000 feet (1,000 feet per roll) minimum. Storage space is not an issue with short runs like this! What is the lead time for custom printed Hot paper orders? Standard lead times for all custom printed Hot Paper orders is 6-8 weeks. Rush orders are available for an additional fee when the production schedule allows. Transit time is typically 2-4 days for the East coast, and 5-7 days for the West coast. How do I decide between Hot paper sheets versus rolls? We find that most of our clients (fast paced restaurant environments) that start with ordering rolls eventually switch to sheets because it is more efficient and cost effective. It is difficult to tear a consistent sheet length off a roll when you are busy preparing numerous food orders. Custom printed sheets eliminate that waste factor and help increase production speed. What are your custom printing capabilities? Hot Paper can be printed with up to 2 spot PMS colors. Sometimes, a screen of either existing PMS color can be made to add the look of a third or fourth color if needed. We can match any standard PMS color on the chart and some metallic colors. What artwork format is required? All artwork submitted must be in Vector form. Adobe Illustrator, .EPS and high resolution PDF files are preferred. Bitmap images are not good enough quality and are not accepted. Need a price quote on custom printed Hot Paper? Contact us today! Looking for the opposite of Hot Paper? 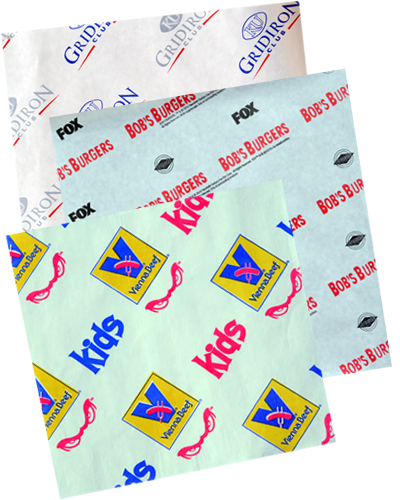 Check out our custom printed Freezer Paper! It protects food in the freezer for up to 1 year!